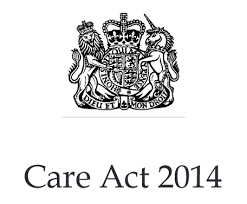 The Care Bill received Royal Assent on 14 May 2014 and has now been passed into law as the Care Act. The Act introduces major reforms to the legal framework for adult social care, to the funding system, the duties of local authorities and the rights of those in need of social care. The Act in its entirety can be downloaded from the Government Publications website. For summaries of the key elements of the Act view the Fact Sheets. The Department of Health guidance on the regulations and consultation process is available here. Implications for social work practice is explored by Community Care online.